Real estate subdivisions… for the developer, platting a subdivision is a chance to put the family name on the map, perhaps with the streets named for the children and their pets … or perhaps something more fanciful is evoked. Here we have some advertising for the first of a trio of plats: Tremont Place (1891), which was followed in 1892 by Tremont and Tremont Park. All three were situated just beyond the end of the rickety Waverly Woodstock electric streetcar line, which after many tribulations began operating in 1891 over the new Madison Street bridge to what is now SE 41st Avenue and Woodstock Boulevard; it eventually extended into the Tremont tracts as far as SE 57th. A post office was established as Tremont in 1892. One of the few tangible reminders of the plat names is found in Tremont Evangelical Church, on Woodstock Boulevard at 71st Avenue. The church is a block from where another early suburban rail line, the Portland, Chicago & Mount Scott, began operating with steam-powered trains, also in 1892. This route came south on 72nd Avenue and turned east onto Woodstock in a wide curve; the curve is still very visible at the intersection. 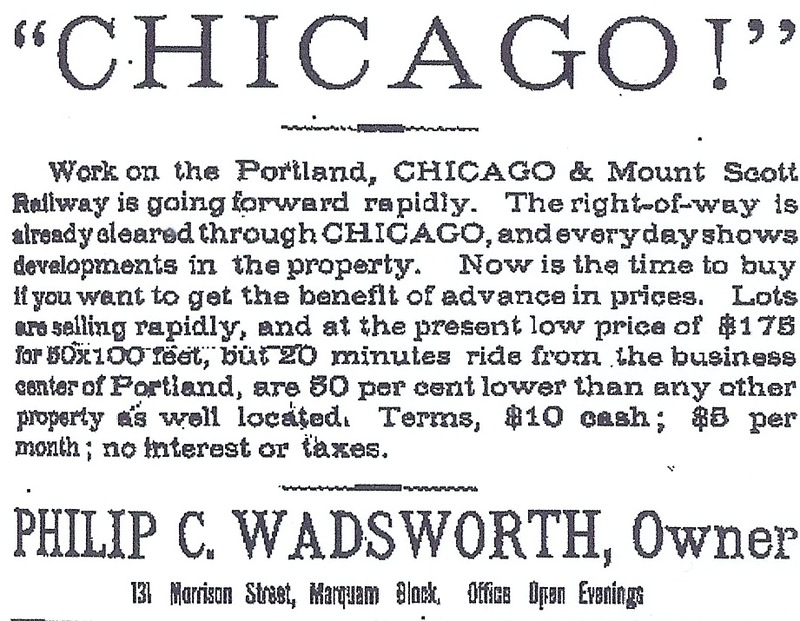 Chicago was another speculative suburban plat, where lots went on sale in 1891. It was the inexpensive and easy transportation to the city center, as well as the suburban aspect and low land prices, that made these lots so attractive. Many buyers purchased more than one lot, holding others for garden and orchard space and for future sale as the tract developed. “Twice the amount of ground for half the money” was a slogan favored by Avery, Churchill & Company, who were the selling agents for lots in Tremont Place and Tremont Park. The lots there were 40 feet by 120 feet, compared with a more common Portland lot of 50 feet by 100 feet; also uncommon were the alleyways in each block. The area today retains the street and lot layout, but many of the alleyways are what you might call vestigial. Or just overgrown. The late Eugene F. Snyder’s homespun history of Portland naming is a splendid compendium of names not only of streets, but also of schools, parks, neighborhoods and real estate plats: Portland Names and Neighborhoods: Their Historic Origins (Portland: Binford & Mort, 1979. NOTE: The dark red areas on the map are the incorporated city of Portland; the red lines indicate “chamber of commerce proposed city boundaries”; the blue areas are platted subdivisions; the bright red box at lower right is Tremont Place. The anomalous red box at the top left shows Portsmouth Villa, an 1890 subdivision of Avery, Churchill & Company.